Cognition is acquisition, storage, transformation, and use of knowledge. Neuroscience is the study of the structure and workings of the nervous system. 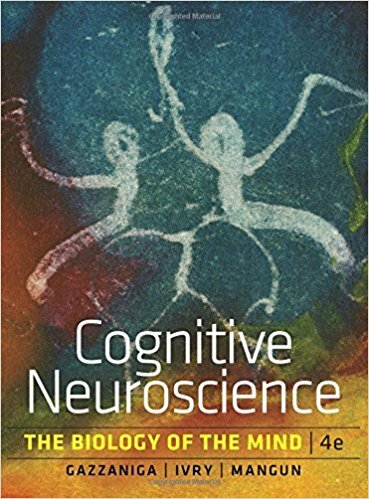 Cognitive neuroscience, then, is the study of how cognitive processes can be explained by the structure and function of the brain. This course briefly introduces the structure and function of the nervous system, the techniques used to study the nervous systems, and the main cognitive functions supported by the nervous system, such as Sensation and Perception, Object Recognition, Attention, Action, Memory, Emotion, Language, Cognitive Control, Social Cognition etc. Chapter 00. Introduction to the Course. Chapter 01. A Brief History of Cognitive Neuroscience. Chapter 05. Sensation and Perception. Chapter 14. Consciousness, Free Will, and the Law. Your will write a reading report of an academic article. be NOT related to language. future directions of this topic (500 - 1000 words).